Cocktails available during the show! Film still of Gösta Ekman and Emil Jannings in At the Crossroads: Music for Faust. Modern Robot, a video and music project created by Ben Singer, brings a 21st-century update on the silent cinema tradition to Fringe NYC with At the Crossroads: Music for Faust. Along with drummer Spencer Cohen, guitarist Singer performs an original soundtrack to director F.W. Murnau's 1926 film. Based on the 16th-century German folktale about a frustrated scientist who makes a pact with the devil, Faust was a big-budget flop when originally released, but has since been recognized as one of Murnau's best works. In what might be one of the simplest shows you'll see at this year's Fringe, Cohen and Singer sit on stage, facing a screen, and play the music while watching the film, while the audience watches both the film and them. Depending on where you're seated (the venue is a club), you might be able to see more of Cohen, more of Singer, or not much of either save the backs of their heads or the dramatic lights shining on the drum kit. But most of the focus is, and should be, on the film itself, which (in an abbreviated version) shows us why director Murnau, best known for 1922's Nosferatu, was poached from Germany by Hollywood. Starring Emil Jannings—then one of Europe's most celebrated actors—as the demon Mephisto, Faust uses brilliant framing, expert lighting, and surprisingly effective double exposure to tell its story. Singer's music functions both literally, as sound effects, and abstractly, as a way of setting mood and expressing emotions. It's both jarring and thrilling to hear such modern instrumentation accompanying these antique images (depicting an even older time period), and reminds us that the best works of art are always ripe for rediscovery and reinterpretation. 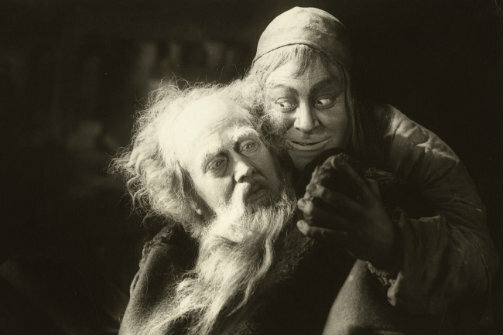 For many audience members today, the rudimentary special effects and non-naturalistic acting style of silent cinema seem awkward, even funny, but it's hard to deny the emotional impact of this tragic tale, in which the tormented Faust (Gösta Ekman) allows Mephisto (Jannings) to use him for a host of immoral deeds, which lead to disaster for an innocent village girl, Gretchen (Camilla Horn). Indeed, when Gretchen enters the story about halfway through, the atmosphere of the performance changes from absorbing and entertaining to genuinely heart-rending, in large part because of Singer and Cohen's skillful work. At the Crossroads achieves an amazing feat: simultaneously taking us back to the silent era while creating something utterly contemporary. It's an experience that might not speak to the Fringe's core constituency, who come looking for the next big thing in live performance. But for those with an interest in classic film, live music, and/or alcoholic beverages (did I mentioned that the venue is a club? ), Modern Robot's offering is a rewarding way to spend an hour during the hectic festival fortnight. At the Crossroads: Music for Faust is by F.W. Murnau with music by Ben Singer. Directed by Emily Gardner Hall. Produced by Modern Robot. The cast is Ben Singer and Spencer Cohen.